The following article originally appeared in the April 2015 issue of The Spectrum Monitor magazine. Every year, I attend two great radio conventions: the Dayton Hamvention and the Winter SWL Fest. While the Dayton Hamvention draws a massive crowd of ham radio operators, vendors, and makers from across the planet–and it’s truly a fun and fantastic event–the smaller Winter SWL Fest is actually my fave of the two. Any why is this? A re-cap of the 2015 Winter SWL Fest might provide some clues. Radio on the Road 3. Janice Laws shared radio recordings and videos from her various travels across the planet, showcasing the local flavor found on the FM and AM dials. The Year in Pirate Radio. George Zeller once again hosted the shortwave pirate radio forum, covering the year in pirate radio, and announcing inductees into the PIrate Radio Hall of Fame. Time Travel, Teleportation, and Spectrum Hoarding for the Contemporary DXer. My good friend Mark Fahey and I co-hosted this forum. In this forum we discussed our obsession with collecting and sharing spectrum recordings, highlighting the added context spectrum playback provides that traditional broadcast recordings cannot. We brought along several terabytes of spectrum recordings from my home in North Carolina and from Mark’s home near Sydney, Australia, to share with this forum’s attendees. Coast to Coast: Geographically Enhanced Mediumwave Reception. Bill Whitacre shared what he has learned from mediumwave DXpeditions to Grayland, WA, and Lubec, ME, over the past 5 years. Bill focused on the advantages of carefully-selected geographic locations for the best DX opportunities. Ultralight Mediumwave DXing. Gary Donnelly hosted a forum which touted the virtues of the most simple radios and receivers and the immense fun that can be had from them. Gary discussed some amazing reception records obtained with these pocket-sized “ultralight” (and ultra cheap!) receivers. Crisis Radio. Michael Pool (a.k.a., “The Radio Professor”) focused on radio as it sounds locally during crises. He shared recordings and airchecks he had captured during natural disasters, terrorist attacks, and moments of civil unrest. Through these recordings, and with the advantage of some emotional distance, attendees could form their own opinions as to how the media handled each event. Radio and Today’s Teenagers. Anthony Messina (age 18) focused his forum on the way teens view radio today, taking into account the medium’s ongoing evolution. Anthony also discussed how he got interested in shortwave radio and DX’ing in the age of internet and smartphones––a remarkably fascinating (and familiar) journey. Kickin’ It Old School: A Return to Regenerative Receivers. In this forum, Skip Arey proposed that a radio design, at the very roots of RF Technology, is experiencing a resurgence: regenerative receivers. He discussed the classic regen circuit and how to use it to bring a new dimension to shortwave listening. The View from Europe. Finn DXer Risto Vahakainu, who travels to the Winter SWL Fest with a contingent of Finnish DXers, reported on the state of the radio hobby in Europe and specifically in Finland. He focused upon the impact of SDRs and also described remote DX sites one can rent for one’s own DXpedition in northern Finland. “UFOs, Gliders and Planes, Oh My!” Tom Swisher––noted member of the SWL Fest so-called “scanner scum”––covered the wide array of frequencies that can be monitored with “your trusty old scanner” after local law enforcement goes digital. Monitoring Dusty War Zones and Tropical Paradises: On Being a Broadcast Anthropologist. Mark Fahey––who travelled from Australia to attend the Winter SWL Fest for the second year in a row––presented a tour of his monitoring station (i.e., his house). We saw how Mark combines several satellite, internet, and SDR feeds from across the globe to create a custom video and audio listening post with feeds. Mark, who is also an avid traveler, shared some of his highly original, out-of-the-box ways of collecting rare radio DX. The Keeping of Time. In this forum, Mark Phillips discussed the importance of accurate time-keeping as our hobby moves toward the digital realm. Mark explained the difference between time sources, why they are different, and why accurate time is so important. Recognizing Digital HF Signals: Eyes and Ears. TSM contributor Michael Chace-Ortiz taught that simply with one’s eyes and ears, it’s possible to identify a number of the digital modes and anomalies on our HF bands. Mike gave an interactive audio-visual tour of numerous modem signals, Over-The-Horizon RADARs, ionospheric sounders, ocean sensing systems, and various other digital oddities that can be heard today. In short: what a dynamic––and diverse––forum line-up! Of course, for the second year in a row, David Goren’s annual Shortwave Shindig was broadcast live from the Fest via WRMI. It was great fun receiving live reports from listeners across the globe. I’m sure some twenty-eight years ago when the first SWL Fest was held, forum topics all centered around the shortwave radio hobby fairly exclusively. But today, how we define radio has changed, and the shortwave radio is no longer the only way to glean accessible content from across the globe. Most of the SWL Fest attendees and hosts, however, maintain and cultivate the spirit of DXing: finding innumerable paths into an ocean of diverse broadcasting. I was happy to be a part of the shortwave radio-related forums that centered on the use of software-defined radios, no doubt a revolutionary game-changer in our listening hobby, and a technology I actively explore (see my review of the TitanSDR next month). While the 2015 line-up was diverse and drew on the expertise of some of the most noted enthusiasts in our field, this experience is actually what I’ve come to expect from the SWL Fest. So many amazing projects, including a Sundance award-winning film (! ), have played a part in making the Fest what it is today. I encourage you to keep tabs on the Winter SWL Fest and make plans to attend in 2016. Details will be posted on the Winter SWL Fest website: https://swling.com/blog. One thing is for sure: if the crazy winter weather conditions this year didn’t stop me from driving several hundred miles through snow and ice to the Fest, nothing is going to stop me next year! Hope to see you there. As you may imagine, since the SWL Fest has been ongoing for many years, strong bonds have formed among Fest attendees––indeed, the group has become like an extended family. This year, we learned during the annual Saturday night banquet that we had just lost one of our Fest family, one Martin Peck, following a battle with esophageal cancer. Marty, as we all knew him, was an incredibly kind fellow, well-loved and warmly regarded at the Fest. 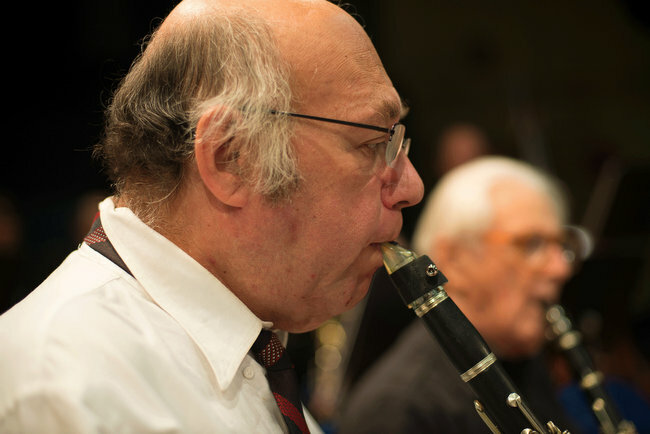 He was not only an avid SWL, but a talented musician, and a member of the New Westchester Symphony Orchestra. Marty could play some of the most obscure interval signals on demand with practically any wind instrument. He found a welcome home at David Goren’s Shortwave Shindig. Marty, pal, we’re going to miss you. This entry was posted in Current Events, International Broadcasting, News, Pirate Radio, Shortwave Radio, SWLers and tagged 2015 Winter SWL Fest, Donna Ring, Janice Laws, John Figliozzi, Mark Fahey, Martin Peck, Marty Peck, Richard Cuff, Sheldon Harvey, Winter SWL Fest on May 8, 2015 by Thomas.